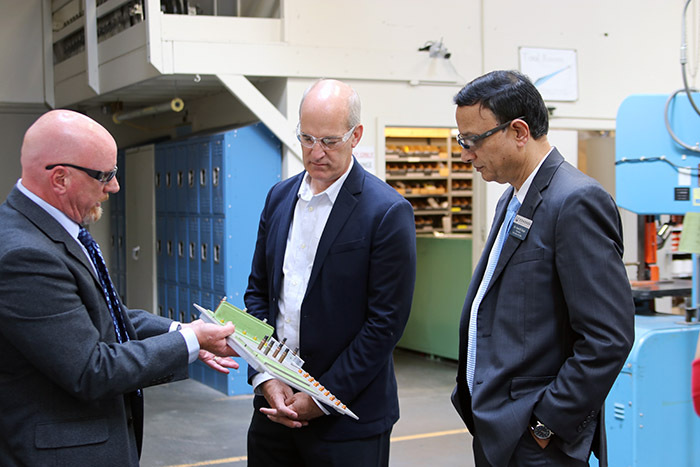 United States Congressman Rick Larsen tours Edmonds Community College training facility. Photo courtesy of Edmonds Community College. The aerospace industry is thriving in Snohomish County, with more than 200 aerospace manufacturers and suppliers who employ about 80,000 workers. However, the industry will soon face a shortage of skilled workers due to its aging workforce. To help fill this critical need, here in 2018 Edmonds Community College offers short-term job training programs at the Paine Field-based Washington Aerospace Training and Research (WATR) Center. The center is managed by the college through an agreement with the Aerospace Futures Alliance. “In 2009, we started talking about the potential of a ‘silver tsunami,’ which refers to the older workforce in aerospace, and now we’re beginning to see a wave of retirements,” said Larry Cluphf, WATR Center executive director. While the aerospace workforce might face a shortage, manufacturing demands do not appear to be slowing. At the Farnborough International Air Show in July, Boeing alone announced more than $100 billion in orders and commitments by the show’s closing. The company is also looking into a new aircraft, dubbed the New Mid-Market Airplane (NMA). With industry needs and demand in mind, the WATR Center’s certificate of completion programs prepare graduates for entry-level aerospace jobs in just 12 weeks. Jobs are available and increasing, and short-term training has long-term benefits, from tackling the skills gap to driving the industry’s future innovations,” Cluphf said. Certificate programs include: manufacturing assembly mechanic, electrical assembly mechanic, quality assurance, tooling, and composites. Starting salaries begin at about $16 an hour. Depending on the company, Cluphf said, workers could double their salary in certain jobs in about five years. The center has more than 1,870 graduates who have found jobs with more than 120 Washington state aerospace manufacturers and suppliers. Washington state Rep. Rick Larsen saw the value WATR Center’s programs add to the county’s aerospace industry during a recent August tour. It was his third visit to the center. “Connecting young people with the skills they need to better compete in the workforce is critical to a strong economic foundation,” Larsen said. Industry has also come to see the WATR Center as a resource. In addition to certificate programs, the center offers customized training to employers, and has trained more than 600 incumbent workers. “We will work with your company to identify training needs and to provide company specific training for your employees,” Cluphf said. “WATR facilitators have experience working with companies to develop and deliver training that protects your company's proprietary information and helps employees learn skills that improve the bottom line for your organization." For more information, visit washingtonaerospace.com.